I would not really call Prof Reggie Nel a dreamer. No, he is a visionary with an action plan, a plan based in reality and on this earth. However, he makes other people dream! He makes people dream of the new and exciting things that are coming to Stellenbosch. Here Prof Reggie has been appointed as Dean of the Faculty of Theology from 1 November 2017. On 24 October this year, a few days before his departure to Stellenbosch, Prof Reggie made time in his heavy schedule to sit down for an interview with me. I have been working at Unisa with Prof Reggie for the past 12 years, and in the URCSA for the same time. I always thought Prof Reggie has a keen mind for the church order. He has good management skills. He works well with people on grassroots level, and even with academics! I work with him in a youth programme, where we talk with young people on how they see the role of the church in helping them to move from the margins to the centre of community life. During this interview I would find out why Prof Reggie is so good with young people, something that equips him excellently for his job as Dean where he has to manage the training and aspirations of young theology students. 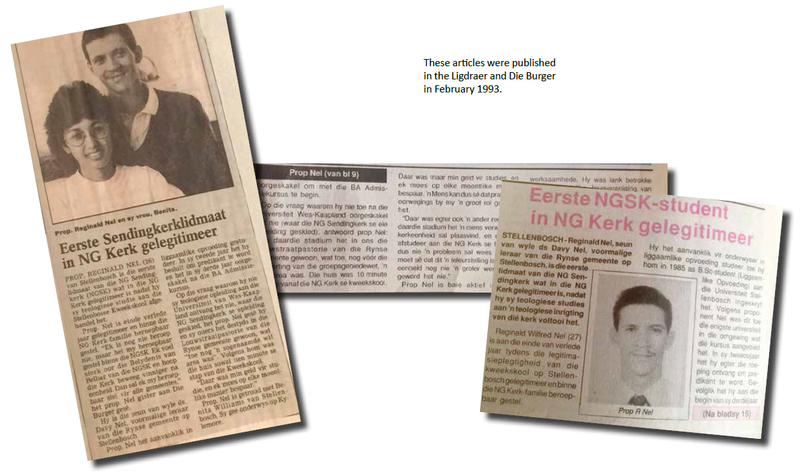 Prof Reggie was born in 1966 in Piketberg, near Malmesbury in the Swartland. His father was a minister in the (then) Dutch Reformed Mission Church, Rev DA Nel. After finishing his matric at Luckhoff Secondary School, he first studied a BA in Physical Sciences, or as we call it in Afrikaans Liggaamsoefeninge. He was an excellent sportman. Cricket was his game. However, he soon decided to answer to the call of becoming a dominee. Prof Reggie was the first – and for a long time the only – brown student who studied at the Faculty of Theology at Stellenbosch. In 1992 he became the first student to finish his theological training here who was not “white”. My goodness, and that was 25 years ago. Looking back to this time, Prof Reggie can honestly say that he was not impressed with the contents of the courses. It was very “Dutch Reformed”. Actually, it was very European and not grounded in the context of Africa at all. Although this was 25 years ago, he thinks that changes are still to be made to focus on Africanity in the courses. Reggie confirms that this was an academic highpoint in his life, working with the contextual theology he was always looking for. Why did he apply for the deanship at US? It is because he takes the partnership between the US and URCSA seriously, says Prof Reggie. And why does he think has he been appointed there? He thinks it is precisely because of his emphasis on Africanisation in his presentation. And how is he going to assist in the Africanisation of the Theology Faculty of US? The curriculum should reflect that we are in Africa, he says, and we should integrate the work of colleagues from the rest of Africa in our training. Prof Reggie imagines a future where everybody would build relations while on their way to the unknown. And, of course, Prof Reggie says, white people have a place in and obligation to help build this imagined future. His passion, says Prof Reggie, is to manage diversity and to reconcile cultures. It seems that the future of Stellenbosch lies in realising the values of the Confession of Belhar – unity, reconciliation, justification – in order to overcome the bitterness of apartheid. We wish you God’s peace and wisdom, Prof Reggie.